Picadillo (Spanish pronunciation: [pikaˈðiʎo], "mince") is a traditional dish in Spain and many Latin American countries and the Philippines (where it is known as giniling, and also Arroz a la Cubana) that is similar to hash. It is made with ground beef, tomatoes (tomato sauce may be used as a substitute), and other ingredients that vary by region. It is often served with rice or used as a filling in dishes such as tacos, savoury pastries or croquettes. The name comes from the Spanish word picar, which means "to mince" or "to chop". Costa Rican versions always include the name of the vegetable which represents the main ingredient to the dish (potato picadillo, ayote picadillo, etc.) and which is chopped and cooked with bell peppers, onions, stock, herbs and spices. It can include some type of protein but that is not essential. 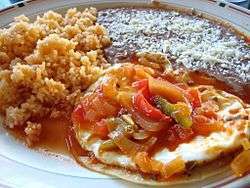 It is often served with tortillas or rice. Cuban versions include peppers, onions, garlic, oregano, cumin, tomato sauce, stock, olives and on occasions raisins, potatoes, and capers, and is usually sauteed in olive oil and white wine, depending on the region. Cuban picadillo is served with black turtle beans and rice. In the Dominican Republic it includes peppers, red onions, garlic, tomato paste, bouillon cube, olives, capers, raisins, hard-boiled egg, cider vinegar, and allspice, and is served with either white or brown rice. In Puerto Rico it is used as a filling for empanadas, alcapurria, piononos and other fritters. It can also be served with rice and beans. The ground meat is sauteed with annatto oil, ham, thyme, cumin, oregano, bay leaf, recaito, tomato sauce and on occasion raisin (soaked in rum), olives, capers, and potatoes. In the Philippines, picadillo is a soupy dish traditionally made with ground beef and either potatoes or chayote. There are also drier versions of the dish. It is also called giniling, Filipino for ground meat. 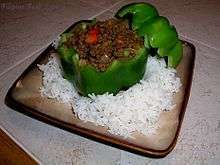 What Cubans call picadillo is known as Arroz a la Cubana to Filipinos. The Philippine version is similar to normal Latino picadillo usually made with raisins, tomato sauce and diced potatoes added, but without green olives and capers, and is often served with white rice, fried plantains (maduros in Spanish, saging na saba in Filipino) on the side, and a fried egg on top. Boiled eggs are also eaten with the dish. In some parts of Mexico, the dish usually calls for onions and lime to be stirred into the meat while it cooks. The sauce is sometimes sweetened by adding sugar to the pan that the meat and sauce are being fried in or, more recently, by using honey, giving the finished meal a somewhat teriyaki or bulgogi like taste. Raisins may also be added to taste. In some coastal or indigenous areas, seafood, ranging from shellfish to tuna, is substituted for the beef. In other parts of Mexico, picadillo is made with blended guajillo chiles, and sautéed onions and tomatillos. The pot roast beef is salted and left to simmer for an hour with onion and garlic, then removed from the pot, and the meat is shredded. Then in a large heavy saucepan, sautee (equal parts) of diced onion and chopped green tomatillos in vegetable oil and add the shredded meat. Mix and stir well for a few minutes. Then add a blender full of blended guajillo chiles (strained first). To prepare the chiles before blending: cut each chile lengthwise and remove seeds, then place chiles in small saucepan and cover in water, then heat over stove for about 5 minutes till softened. Note: after adding the strained blended guajillo chile sauce to the sautéed shredded beef mixture, cover and simmer for another 30 mins. When ready, this dish can be served as is or add some pinto beans for extra flavor. 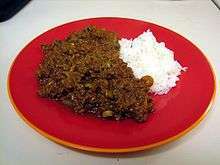 Wikimedia Commons has media related to Picadillo.